From the beginning of time, man has dreamed of lifting up off the ground. For thousands of years, birds have been the center of envy and admiration! If man was not able to grow wings, then he would use the ace up his sleeve: intelligence. At first, man flew only in his dreams, until his dreams became the means of flying. Even though many car makes and models exist, they are not so different from one another. Same for bikes or motorcycles. But when it comes to flying, diversity is extraordinary: aircrafts, helicopters, hang gliders and paragliders, sky-rockets and drones, flying balloons and flying backpacks, and many others. Man even flew in outer space, where no bird has ever gone! However, there is something more fascinating than flying: levitation. The cancellation of gravity, which sometimes makes things appear to lift up off the ground and float in the air, it looks like some form of magic. Is levitation really possible or is it all just an illusion? Let’s find out! 1 What is levitation, really? Flying is not levitation because it requires the use of various aspects of an aircraft (like engines, wings, etc.) and/or is dependent on certain natural conditions that cannot be controlled (air currents, etc.). An object being thrown in the air or someone jumping off the ground is not levitation, given the fact that there is no stability while they are in the air. Jesus walking on water is not considered levitation because contact with a liquid involves visible support, even if it isn’t strong support. Don’t even get me started on boats. Objects floating in the cosmos is not levitation because there is no gravity in space. So, what is levitation? The answer is rather complex. Initially, levitation was considered paranormal activity. Supposedly, it is one’s ability to lift up off the ground, without any physical substances, all the while hovering for a period of time, in a position that is controllable. In most religions, dating thousands of years ago, levitation practice references were found. 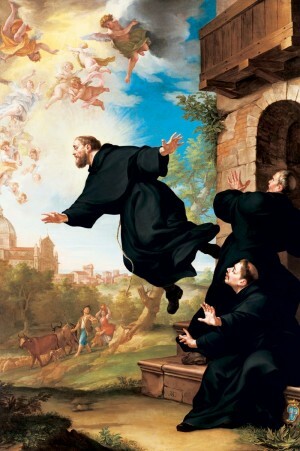 Those who were believed to have something to do with levitation were either considered masters/saints or demons/possessed. Currently, no one has succeeded in proving, without a doubt, their ability to levitate in front of specialists. Illusionists have revealed more apparent levitation tricks as well as invented some new methods. These tricks are impressive, even as entertainment. Anyway, levitation really exists. And not in one way, but in several. Various physical phenomena have this effect. Scientifically speaking, levitation is defined as the process in which an object or person lifts up in the air (usually, very low), without mechanical support, in a controlled way. If you’ve played with magnets, then you know that they have two poles. When they are close to each other, if their poles are oriented toward one another, then they will attract and “get stuck”. But if their poles are oriented in opposition, they will strongly repel one another, making it difficult to push them close to each other. I guess you can say they are become a bit hardheaded! That’s what magnetic levitation, the best known form of levitation, is based on. It is called maglev, for short. Apparently, two magnets, in the horizontal position, with similar poles in opposite directions, will reject one another. You can already imagine how the one on top floats in the air above the one laying down. But have you ever tried it? The reality is that, in this simple version, the top magnet will unbalance, and will change its orientation by rotation, and when the rotation exceeds more than 90 degrees, the rejection becomes attraction… Now, they are stuck! Sure, you can do all kinds of tricks to keep the top magnet from rotating. For example, you can put it in a sufficiently narrow tube (transparent, to see what’s happening inside). But this is not levitation, because the body has lateral support. When the system only ensures lifting, without stability, it means that you obtained pseudo-levitation. Luckily, some people don’t give up so easy. German physicist Werner Braunbeck played with magnets too, until he discovered that some magnetic fields do not comply with Earnshaw’s theory. What a wonderful disrespect! In such a magnetic field, a body can levitate. You can quite easily obtain such a magnetic field by using at least 4 magnets, usually cubic ones, seated in a certain position. The body that levitates must be made of a diamagnetic material. Diamagnetism is the property of a substance to form a magnetic field which opposes to other magnetic fields, applied from the outside. This happens because the exterior magnetic field disturbs the rotation of the electrons around the nucleus of each atom. The electrons oppose, just like you do when someone tries to get on your nerves. Just like that, each atom becomes a magnet – an extremely small one 2)”Introduction to the Electron Theory of Metals” by Uichiro Mizutani, book published by Cambridge University Press in 20013)”Diamagnetism” in Encyclopædia Britannica. Small, but many! Diamagnetic materials are as common as they get. Easily explained, here are some that magnets do not stick to: wood, water, plastic, copper, etc. So the levitation experiment doesn’t become expensive, it takes a very light object with strong diamagnetism. However, you can find sets with 4 or even more cubes and a pyrolytic graphite, ready for levitation, on the market. But enough playing, let’s get back to serious matters! On a similar system, but at another level, higher magnetic fields can be produced. Electromagnets and other devices are used for this. High Field Magnet Laboratory, at Radboud University (Nijmegen, the Netherlands), proved that even natural big bodies can levitate. To obtain a suitable magnetic field, a Bitter electromagnet 5)”Bitter electromagnet” in Wikipedia was used. Such devices are among the most powerful sources of magnetic fields. Because water is diamagnetic, any body rich in water is suitable for such an experiment. For example, a little frog 6)”Of flying frogs and levitrons” – scientifical study conducted by M.V. Berry and A.K. Geim, published in European Journal of Physics in 1997. Yes, a living being! Relax, nothing harmful happened to the frog; it simply became slightly confused. One of the most spectacular applications of magnetic levitation is the train system that uses magnetic fields to go forward by levitation. This way, eliminating the friction, spectacular performances are obtained. 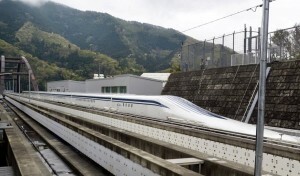 On April 21, 2015, in Japan, such a train reached 603 km/h 7)”Japan’s maglev train sets world record: 603 kph” – news by Wilfred Chan for CNN on April 21, 2015! These trains already compete with aircrafts. Especially if you take into account other advantages like low noise, no pollution, greater safety, etc. And this is only the beginning: it has the potential to reach 6400km/h 8)”Trans-Atlantic MagLev: Vacuum Tube Train” by Carl Hoffman, article published in Popular Science on April 12, 2004! Imagine a future where, at least, big cities will be linked by high speed underground trains. Some kind of shaft subway. You can get anywhere in only a few hours! Very close to teleportation… Did it ever strike your mind that levitation has something to do with this? Do you remember the school experiment where you rubbed a balloon or a plastic ruler on your hair or clothes, and afterwards it attracted small pieces of paper? Fascinating for any child! But here’s how it works: Friction produces an electrostatic charge, which can lift the small pieces of paper from the table using its attraction force. I think you already have a clue: if you could adjust the electrostatic field and find optimal positioning, then the small pieces of paper (or other objects) might raise to the electrostatic field, but without touching it. And we would obtain electrostatic levitation! Unfortunately, Samuel Earnshaw puzzles our game again with his theorem 9)”Electromagnetic Theory” by Julius Adams Stratton, book published by Wiley-IEEE Press in 2007. He says it is impossible to find an equilibrium point. The object can float, but in a chaotic way, which is not quite levitation. Good thing that what seems like “impossible” for some is actually quite “possible if done another way” for others. The puzzle was solved by Dr. Won-Kyu Rhim at NASA in 1993. He conceived a feedback system, which tracks the position of the object. To give you a glimpse of what this means, when the object goes too high or too low, the system adjusts the electrostatic charge very quickly, in order to bring it back to its initial position. The result is a type of equilibrium. If you ever blew on a soap bubble, then you would’ve noticed the way it rises. Imagine that you can blow air continuously, so that the obtained force will compensate gravity. This is quite simple. As usual, stability is the real issue. Many solutions were found, but the most interesting, by its simplicity and good precision, is a conical nozzle that can carry in levitation 1-3mm spheres. Bigger balloons can float relatively stable, but not sufficient enough to levitate. The fact is that aerodynamic levitation exists. And it also has practical applications in various fields, such as glass production. A special version is the one called gas film levitation. In order to quickly understand what we’re talking about, it is something that air-cushion vehicles are using in order to not touch the surface over which they are traveling. Only in this case, because the lifting is done by the vehicle engines, it is debatable if this can be called levitation. But if a similar system is outside the lifted body, the conditions are satisfied. Some gases, like xenon, have rather high density. If high pressure is exercised upon them, the density can rise so much that it will attain fluid properties, or even solid properties. An object can float on such a gas like a boat on water. Only you can’t notice it floating. This is buoyancy levitation. If you ever put your hand on a sound speaker while it’s playing music, you know it vibrates. If the sound speaker is placed face up and you pour dust on it, the dust will start to jump under the impact of vibrations. How can you control these chaotic movements? Well, it is possible. In more than one way even. So, acoustical levitation is possible. Levitating a few kg objects has been achieved. Some systems even allow movement of the levitated object above an emitters array, by a fine change of the intensities of some cells from the array. The pharmaceutical industry is the main beneficiary, because, in this way, drug contamination during the production process is prevented 10)”Acoustic Levitation Made Simple” – article about an invention by Marco A.B. Andrade, Nicolás Pérez and Julio C. Adamowski, published in Applied Physics Letters in January 2015. We’ve seen that levitation can be obtained with many kinds of waves. But you know something? Light is a wave, too. Sounds too good to be true, right? If you try to move things using a flashlight, you won’t succeed, except if you punch them. A flashlight has such a weak light, that atoms don’t give an “electron” about your attempt. Arthur Ashkin managed to do this using a laser, that means an amplified light. In the installation he planned, dielectric spheres up to 50 micrometers can levitate. You will say it’s not a big deal. But when you think that light can overcome gravity, it’s just too impressive. And optical levitation is only in its infancy. Theoretical studies show that, in a similar way, bigger objects can levitate 11)”Scattering-Free Optical Levitation of a Cavity Mirror” – scientific study conducted by de G. Guccione, M. Hosseini, S. Adlong, M.T. Johnsson, J. Hope, B.C. Buchler, P.K. Lam in 2013. We are at the limit between science and science-fiction. Casimir effect is a force from the quantic field theory which makes possible, under certain conditions, two, very close, bodies attract 12)”Casimir effect” in Encyclopædia Britannica13)”The Casimir Effect: Physical Manifestations of Zero-point Energy” by K.A. Milton, book published by World Scientific Pub Co Inc in 2001. By manipulating this effect, scientists have managed to make extremely small particles levitate. For now, levitation with Casimir force is just a scientific curiosity, but, starting from here, who knows what can happen next. I know you would like to levitate, too. But no one invented a machine that could produce a field strong enough to be able to lift you… however many kilograms you said you weigh? In any case, levitation will remain fascinating. One of the endless wonders. You will find out more by studying it. And playing with magnets. In case, it is possible to Levitate, you will not need any known transport to travel. Just levitate and go where you want to go!!! In India, demonstrations have been given that you can Levitate. Disciples were taught Levitation by Mahesh Yogi and demonstrated in Delhi. Competitors were asked to sit cross legged, breath in a taught manner. They floated a few inches above the ground, in a Hall, spectators watching, they moved forward and dropped on the floor, one by one, only one reached the other end, to claim some Prize. Photos were flashed in Newspapers the next day. The year 1985, I was in Jhansi. Need a Guru to teach the Method! Mahesh Yogi had his own TV Studio and was often seen on TV, giving discourses. I believe some Yogies are there, even now, who travel by Levitation or some other unknown manner and travel wast distances to take objects or bring objects. They won’t demonstrate in public nor willing to teach others. It is believed Guru Nanak had such powers and traveled all over the Worled, along with Bala and Mardana, his two assistants. No one had seen him using any available transportation. Or any flying object, which were Not in existence. One of his miracles is Sweet Reetha, which I am trying to grow in Secunderabad. Years ago as teenagers in Catholic high school our Religious Education teacher told us about a group of girls leviateing a friend at a pajama party . Of course at the next pj party we had to try it. We gathered around one of the girls lying on the floor , lightly touched our fingers to her, chanted , and she began to rise off the floor. She got about waist high , we all screamed , pulled our hands away and vowed never to do it again !